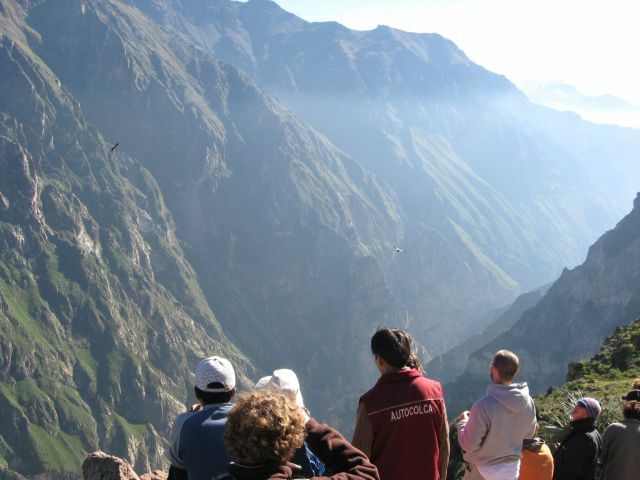 The Colca Canyon Trek of two days is for hikers with some experience in trekking, who don't have a lot of time but still want to reach the bottom of the canyon. During these two days hikers have early wake ups. The first day trek is around 7 hours with trails downhill, flat and uphill, the second day trek is 3 hours uphill. At 3:00/3:00 hrs. a.m. we will have departure to Cabanaconde in the Colca Canyon, about 6 hours driving from Arequipa. On the way we have a stop for breakfast, later we continue to La Cruz del Condor (this is the best place to see the Canyon and the Condors) here we have another stop, after we go 20 mtes more by transportation, then our trek down hill starts. We trek downhill from 3.300 m.a.s.l. to reach the bottom (3 ½ hours approximately), at an altitude of 2.100 m.a.s.l. We will have lunch and some resting time in San Juan de Chuccho, a village with many fruit trees. We continue to Cosñirhua and Malata towns (beautiful places with a lot of vegetation, a museum, its very old spanish style church, and very friendly local people). Then it is time to start the descending hike, this time to the deepest part of our trek to reach "Sangalle", a village at the altitude of approximately 1.900 m.a.s.l. In this place you can enjoy the swimming pool of temperatured water of 20ºC. At night we will have dinner, and we stay overnight in bungalows made of bamboo. 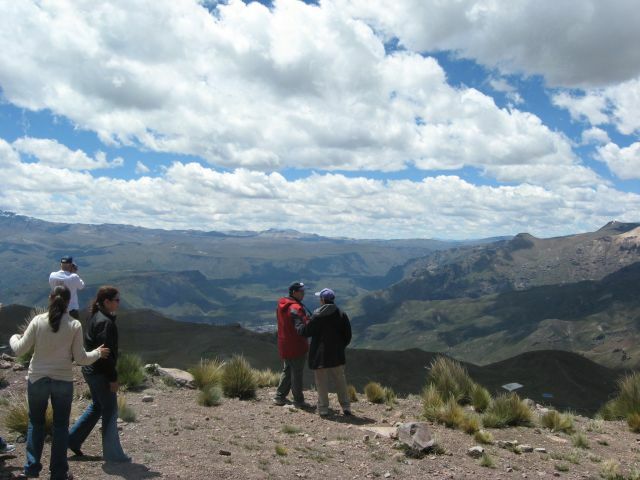 At 05:00 a.m. we will start trekking uphill to Cabanaconde Town with the help of torch lights (3 hours approximately). We will have breakfast in Cabanaconde. From there we will go to Chivay, on the way we will have a great view of pre-Inca terraces, some arqueological places and colonial towns amongst others views. Around noon we arrive in Chivay at the hot springs "La Calera", with water temperatures of 38°C. In Chivay we will enjoy a typical lunch of the region. In the afternoon we will have transportation back to Arequipa. On the way we descend from 4.830 m.a.s.l. to 2.325 m.a.s.l. and pass through a nacional reserve and Pampa Cañahuas, habit of the four species of South American camelides (llama, alpaca, vicuña and guanaco). At the end of the afternoon we arrive in Arequipa (approximately 18:00).